It’s the month to enjoy cocido madrileño, a boiled dinner that may be the national dish of Spain. And, you thought it was paella or gazpacho! 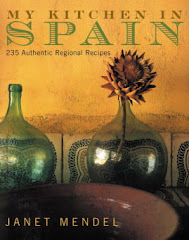 In fact, a meal-in-a-pot is enjoyed in every region of Spain. It’s a family meal, perfect for a weekend or a holiday when there’s time to cook, time to savor. Through 31 of March, 37 restaurants in Madrid and the surrounding area are featuring the famous cocido in its many versions. 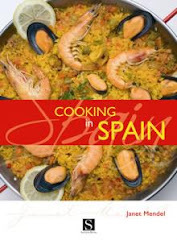 For a list of the participating restaurants, go to http://www.rutadelcocidomadrileño.com/restaurantes-participan.php. And, if you’d like to try this famous dish at home, here you have the recipe. 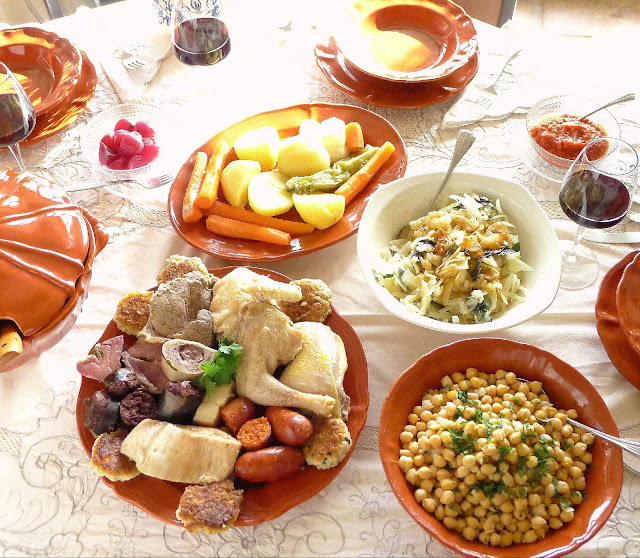 Cocido madrileño, a meal served in tres vuelcos--first the soup, then a platter of meats and chicken and another of vegetables and chickpeas. First off, I didn’t grow up eating cocido. No abuela (grandmom) taught me the tricks. I don’t have any castizo roots at all. 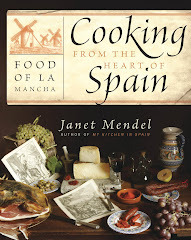 I learned to make Andalusian cocido/puchero 50 years ago from village cooks. 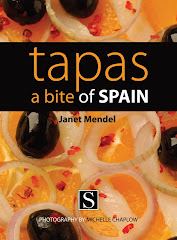 But the madrileño version, I learned from restaurant tastings and Spanish cookbooks. I’ve tried to give you a pretty authentic recipe—but I admit to taking some liberty with the hallowed recipe! I use whole-wheat bread for the relleno, the typical dumpling that accompanies cocido. I substitute kale for some of the cabbage. And, while I always use a chunk of serrano ham and bone for the inimitable flavor and aroma it lends to the soup, I have never really liked the texture of cooked serrano ham. But, no! I would never, ever, substitute cooked smoked ham. It just wouldn’t be cocido madrileño. 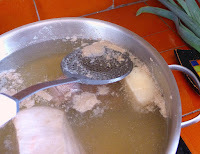 A cocido can be a one-pot meal, if you have a really big pot (olla or cacerola). You’ll have to pay close attention to cooking times, adding ingredients to the pot so that they’re all done at the same time. With experience, this is no big deal. 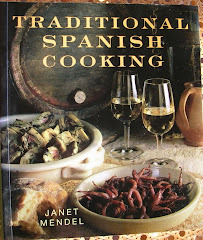 But if, like me, you only make a full scale cocido once or twice a year, the chance of having underdone beef or disintegrating potatoes increases. Serve the soup first with fideo noodles. Then comes a heaping platter--beef, chicken, chorizo, pork belly, marrow bones, cooked ham, morcilla sausage, salt pork and relleno, fritters that are poached in the broth. Stewed cabbage is dressed with sautéed garlic and pimentón. I've added some (non-traditional) kale, as well. Chickpeas cooked with the meat and ham bone soak up lots of flavor. These are the castellano variety. I opt to use three different pots. 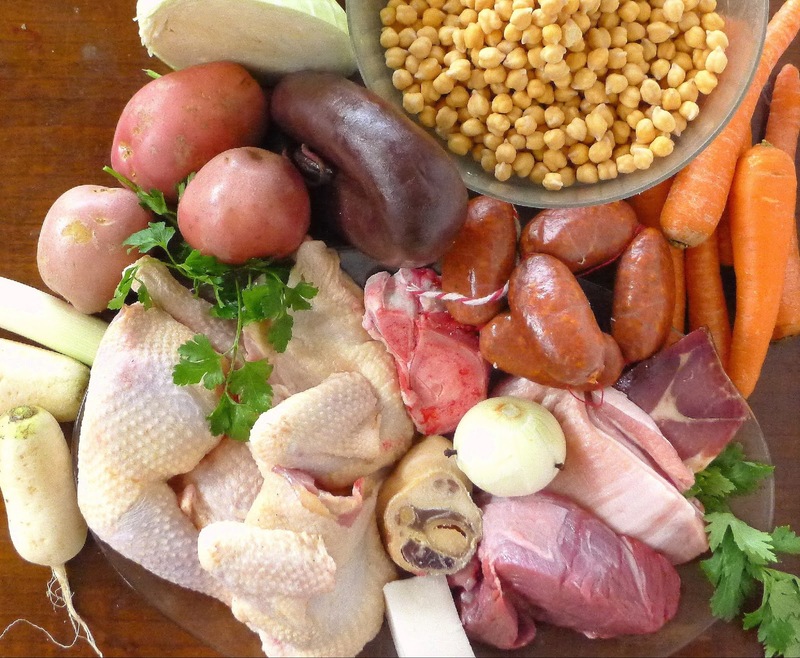 In the first one, the biggest, the chickpeas cook with the meats, bones and chicken. This produces the flavorful caldo, broth, that will be served as a first course. In the second pot, with an extra few pieces of meat bones, I cook the potatoes, turnips and carrots. In a third pan, I cook the chopped cabbage along with the chorizo and morcilla sausages. If you prefer cocido-“light”—with reduced fat—I suggest making it a day in advance. After straining the soup, chill it overnight. Then it’s easy to lift off the congealed fat and discard it. Keep the meats and vegetables covered with some of the remaining broth. Refrigerate them overnight too. 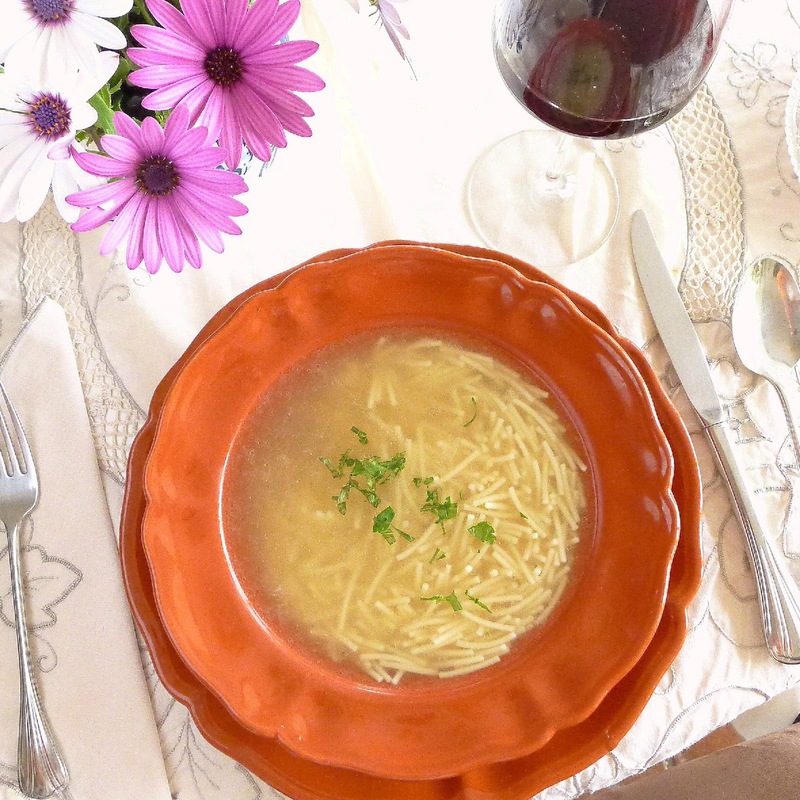 Before serving, heat the strained and defatted soup in one pot and cook the fideo noodles in it. Reheat the meat and vegetables in another pot. Relleno--patties of bread crumbs are fried, then simmered. The relleno, also called bola or pelota, is a cross between a dumpling and a fritter. 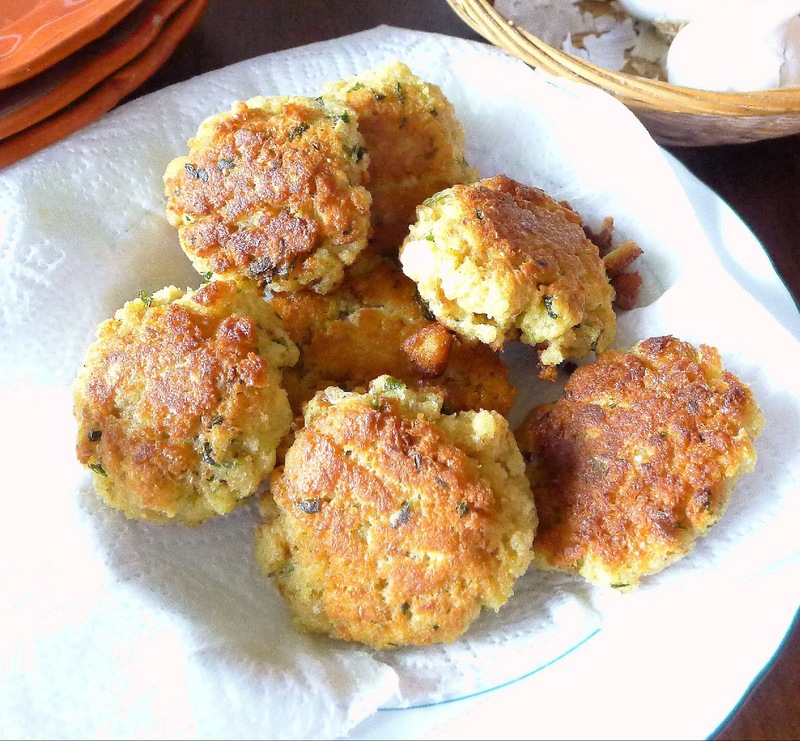 Made of bread crumbs, sometimes with the addition of ham or minced meat, it is shaped into small patties, fried in olive oil, then simmered in the soup pot. In households where meat was scarce, the relleno was a way of extending the meal. Now it’s a cherished addition to cocido, especially liked by kids. Stewing hen or boiling fowl adds a lot of flavor and doesn’t fall apart with long cooking. If using ordinary chicken, add it after the pot has been cooking for one hour. 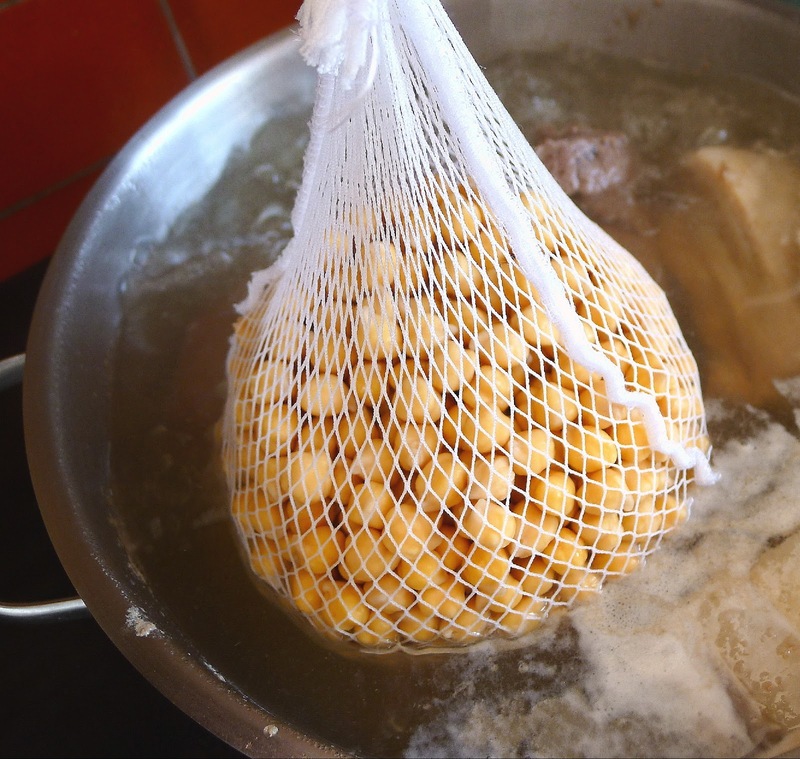 Put the chickpeas to soak in warm water 8 hours before cooking the cocido. Add them to the pot when the water comes to a boil. If you have hard water, use filtered or bottled water to cook chickpeas. 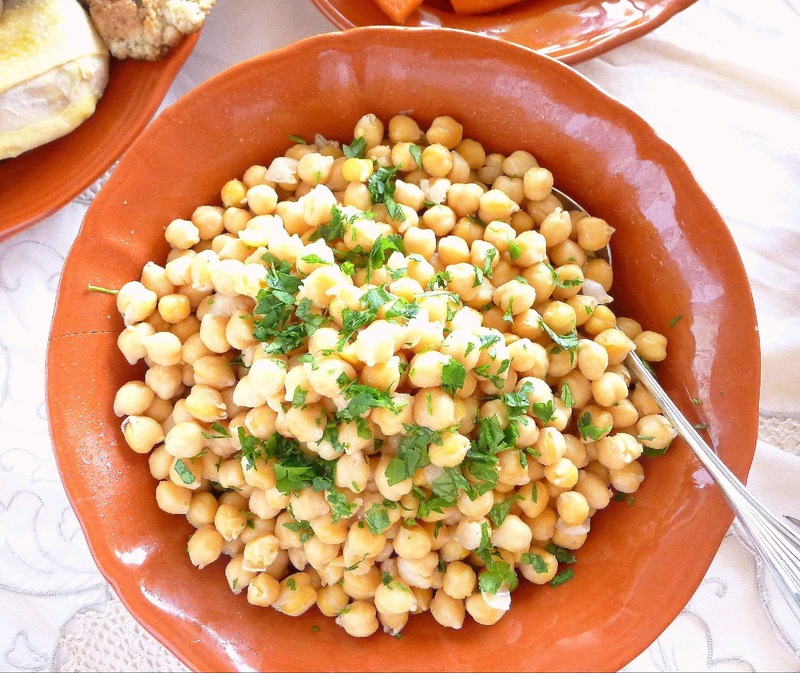 You won't use a whole pound for one meal, but cooked chickpeas have many uses. 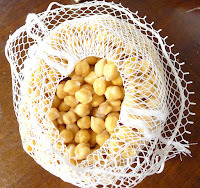 Chickpeas cook in a mesh bag. 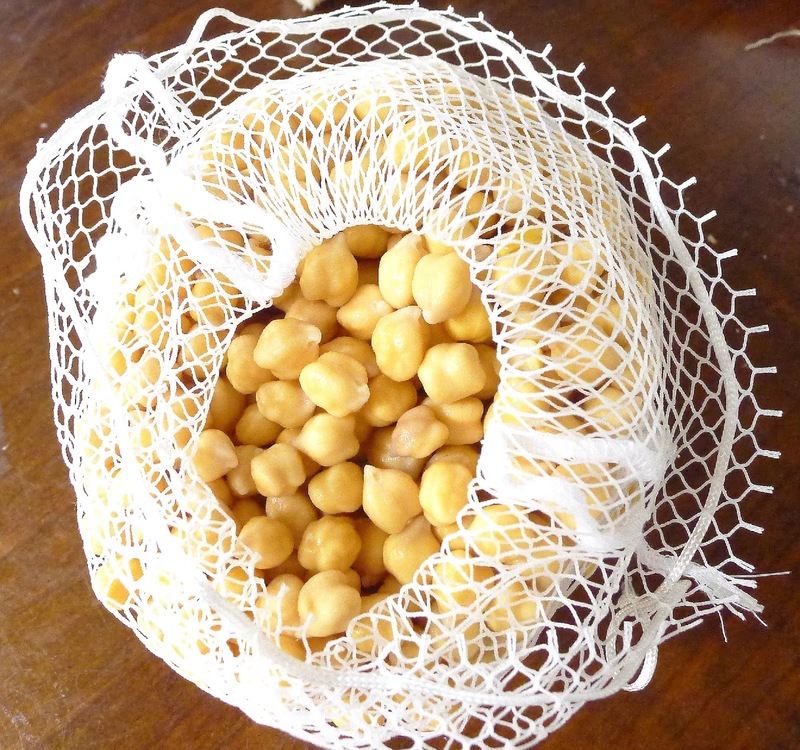 Spanish cooks use a malla, a mesh bag, to cook the chickpeas, so they can be easily removed. Skim off the foam that rises as the water comes to a boil. Skim again after adding the chickpeas. If using ham and salt pork, additional salt probably will not be needed. Taste the broth after 1 hour of cooking and add salt if necessary. Allow 1 medium potato per person or use larger ones and cut them in half to serve. The soup, with meat, chicken and chickpeas, will be done in about 2 ½ hours. 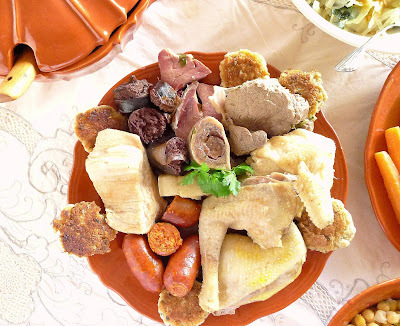 Two kinds of sausage, serrano ham, pork belly, salt pork, ham bone, stewing hen, beef shin and marrow bones plus carrots, potatoes, turnips, cabbage and chickpeas--cocido is a whole meal in a pot. Day before cooking the cocido, put the chickpeas in a large bowl. Add 1 tablespoon of salt and enough hot water (not boiling) to cover them by three times their depth. Allow to soak overnight (8 hours). Drain the chickpeas and rinse them in warm tap water. Skim the foam from the broth. Add the onion stuck with 2 cloves. Add leek, trimmed, and the stalk of celery. Add chickpeas to the pot. Add the chickpeas. Bring again to a boil and skim again. Cover the pot and reduce the heat so the liquid bubbles gently. After 1 hour, stir the pot. Taste the broth and add salt if necessary. Cook until the chickpeas, beef and chicken are very tender, about 1 hour longer. Allow the pot to settle for 10 minutes. Skim off the fat that rises to the top. If you’ve cooked the chickpeas in a special bag, lift it out and reserve the chickpeas in a bowl. Place a strainer lined with cheesecloth or dampened kitchen towel over a clean pot. Ladle the soup into the strainer. Use approximately 8 cups to serve 6. Cool the soup, then refrigerate until the fat solidifies (overnight). Skim off the fat before finishing the soup. In a third pan, cook the chopped cabbage in lightly salted water with the chorizo and morcilla until the cabbage is very tender, 30 minutes. 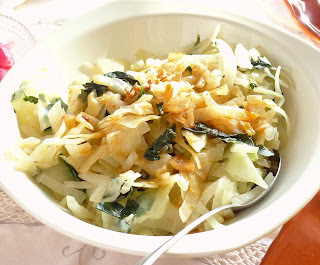 While cabbage is cooking, heat 2 tablespoons of oil in a small skillet and sauté the sliced garlic. Stir in the pimentón, vinegar and spoonful of water. Drain the cabbage. Place it in a serving bowl and pour over the garlic oil. Place the cooked chorizo and morcilla on a platter with the marrow bones, beef, pork, chicken and ham. Add the relleno. On another platter, arrange the potatoes, carrots, turnip and leek. Drizzle them with olive oil and sprinkle with coarse salt. Place the chickpeas in a bowl. Drizzle with olive oil and sprinkle with chopped parsley. Skim off fat from the strained soup. Bring it to a boil and add the fideos (noodles). Cook until they are al dente, 5 minutes. Serve the soup as a first course. 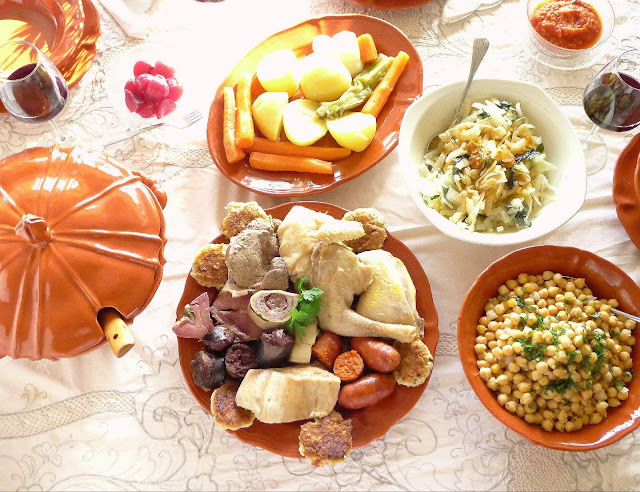 Serve the platter of meat and chicken, the platter of vegetables, the bowl of cabbage with garlic dressing and the bowl of chickpeas. 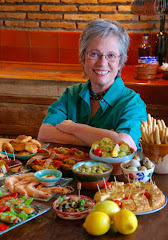 Serve pickled onions, pickled green chiles and tomato sauce on the side. Mix breadcrumbs with garlic and parsley. 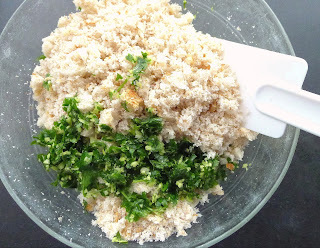 Combine the breadcrumbs, garlic and parsley. (Use a mini-processor to make the crumbs and to chop the garlic and parsley.) Beat the eggs with 1 tablespoon of water until they are foamy. Add to the breadcrumbs with milk and salt. Form the mixture into 6-8 2-inch patties. Heat oil in a small skillet and fry the patties until they are browned on both sides. Drain on absorbent paper. Add the relleno to the pot with the meats and cook 15 minutes. Serve the relleno on the platter with the meats. Serve the cocido with a red wine with denominación de origen Madrid. I had it once at the home of friends in Madrid. Most amazing concept. Couldn't bring myself to sample from the chunk of grassa though! All the same, it was DELICIOUS and an excellent pastime for a rainy Sunday afternoon. Christine: Lucky you, to sample a true madrileño cocido. My guests avoided the chunks of pure fat (tocino), too. But with leftovers, I'm going to squish it up on toast. Incredibly delicious! Wow, Janet! Not so much a recipe as an occupation. Followed by a strenuous workout to fight off the flab (as we say in UK). Maybe just selected highlights for me. JohnD: Flab and high cholesterol! Stay tuned for the leftovers. Hi Janet! Your recipe is divine, I just wanted to say that I'll definitely try it whenever I can. It must be so delicious!! Thank you for posting it!